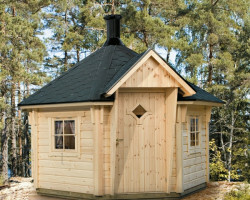 Building an octagonal or a hexagonal summer house has never been easier than with our prefabricated sheds made of the finest Nordic wood. 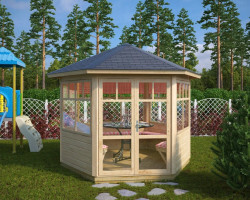 Installation of these summer houses takes no more than one or two days for two persons. Most of these elegant summer houses can be built on well balanced stone slabs, without preparing an expensive concrete foundation. 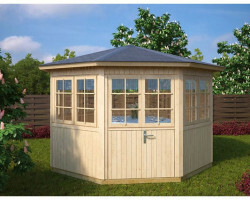 Most of these garden buildings are supplied with prefabricated wall elements, installed windows and doors and ready-made roof and floor elements. 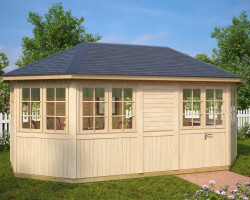 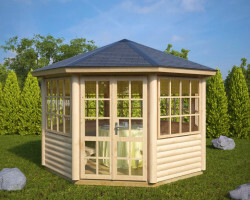 These prefabricated walls, floor and roof elements are the reason, why our hexagonal and octagonal summer houses are slightly more expensive than the other garden log cabins. 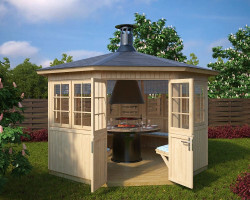 On the other hand, this makes your summer house DIY installation very quick and easy. 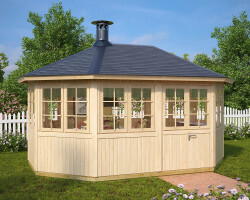 All standard hexagonal and octagonal summer houses have one wall element with double doors and all others with windows. 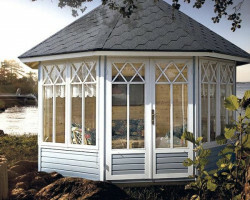 The number of windows can be decreased by as many as you wish. 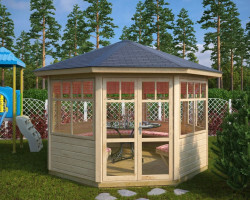 For example: You may have an octagonal summer house with only 2 windows and other wall elements entirely wooden walls. 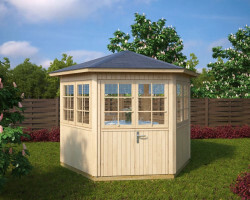 The smallest ones are hexagonal summer houses (6 m²), followed by octagonal summer houses with area of 9,5 m², 15 m² and up to 18 m². They are great choices to add elegance and romance to your backyard. 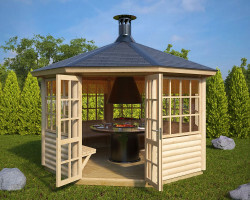 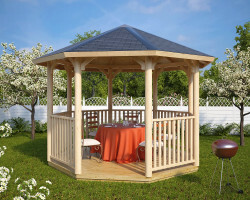 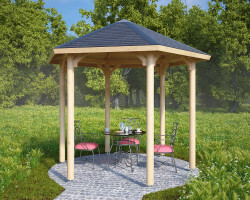 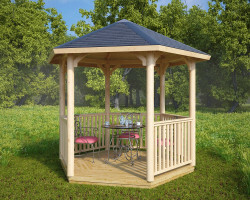 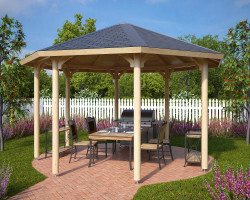 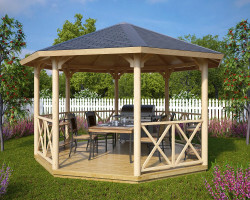 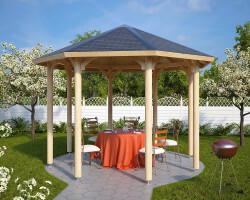 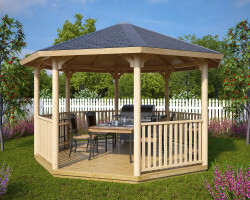 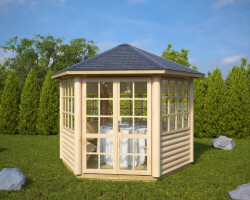 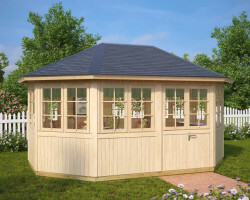 Besides our garden rooms, we supply hexagonal and octagonal wooden gazebos, garden pergolas and BBQ huts. 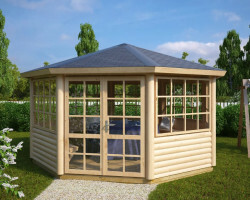 If you are looking for high quality octagonal and hexagonal sheds and summer houses, then you have come to the right place!